Estimated reading time: 3.1 mins. I have been sketchnoting for a while now and I do find it a very easy way to personally document and retain information. 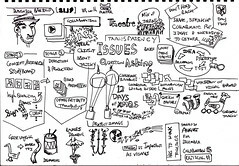 Over this period of time I have sketchnoted a good deal of technical and non-technical talks sometimes about subjects that I didn’t have a full understanding of. The other day I was reviewing my sketchnotes, musing over this talk or that event, and I noticed something, a pattern within the sketchnotes. Due to the nature of sketchnoting, I do find that I will often get into a flow, listening to the speaker’s voice, and occasionally glancing at the screen. It really is a case of loosing track of time, as I become completely focused on the drawing and the presentation. 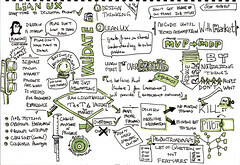 In a way I’m almost channelling the talk into the sketchnote. The patterns related to the level of maturity of the talk and the way it was presented. The more mature talks will often have all the problems worked out and run smoothly. A mature talk doesn’t mean that it has been presented a lot either. 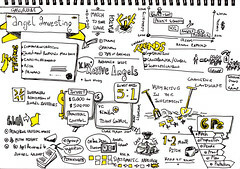 I have sketchnoted talked that just worked on their first presentation. However you could tell there was a degree of maturity in the presentation development. The better the talk, the more streamlined and well paced it is – hence the easier it becomes to sketchnote; as I tend to follow the logical rhythm of the talk itself. Now I’m not going to point of cases where the speaker was poor at presentation or the talk just needed a little more work, as that would be unfair to the speakers concerned. Most of the ones that were hard to sketchnote I have approached personally anyway. There is some commonality with the resultant sketchnotes and the delivery of the talk. Generally if a talk is loaded with lots of good information in the beginning then this will be reflected in an overloaded first half of the sketch. You want a sketchnote to be balanced and clearly highlighting the key points and representing the overall theme of the talk. If the speaker is unclear about a point or seems to be muddled on the clarification of the talk sections or major concepts – then I find this is reflected in the sketchnote, topics will merge, concepts will in turn be indistinct. Sure while I’m sketchnoting I will try and pull out the relevant points and transcribe them, but sometimes it’s an uphill battle. If the balance is out in the talk, for example, if the latter half is just a summary of the first half. You are going to get a large graphic at some point, as I’ll end up with time to draw big picture; as I wait for new information or ideas to be presented. If the talk presents as not having any real direction or flow to it, then the sketchnote will look the same. These talks can be frustrating to sketch, as you really have no idea where the speaker is going. I have had talks that by the 40 minute mark of a 45 minute talk the speaker was yet to reveal the overall theme of the presentation. 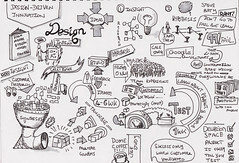 Again this is reflected in the sketchnote as not having a clear theme. For speakers if the sketchnote is balanced and all the major points are covered, that’s a good thing. If topics are merged or it’s not balanced then maybe something was a little off with that talk. Think about this when you are looking over a sketchnote. If you sketchnote have you seen this patterning occurring too?